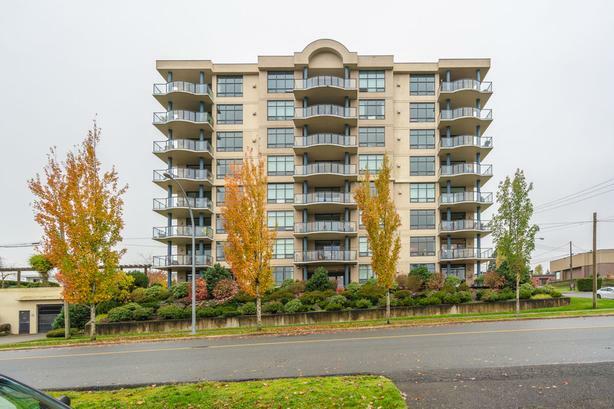 Located in the Brechin Hill neighbourhood, across from Nanaimo's stunning waterfront, this gorgeous 2-bedroom, 2-bathroom plus den condo is the perfect place for a family to call home. With ocean views, custom tile flooring in the bathrooms and entry, an updated kitchen with stainless steel appliances and granite counter tops; the living room showcases a beautiful natural gas fireplace and engineered hardwood flooring in the living and dining room; both bathrooms have been updated with soaker tubs and the master ensuite includes a stand-up separate shower with in suite laundry. There is ample space in the dining room/living area for all entertaining. Open concept living has never been easier with 1425 sqft of living space. Water views from the balcony and a great location to downtown and all major amenities make this home a must see. Measurements are approximate, please verify if important.